I'd love to meet you and talk deer for a while, so come on out and visit with me. Also, you really do need to see this magnificent buck in person to appreciate it's size and to see the quality of the mount by Randy Walling. I can juggle too... but I've been told it is more entertaining to hear me try to snort-wheeze. 3/17/2018 I will be speaking at a Game Dinner hosted by First Baptist of Upper Burrell, in New Kensington, PA.
3/3/2018 I will be speaking at a Game Dinner hosted by Harvest Baptist Church in Wapakoneta, OH. 2/3/2018 I will be speaking at a Wild Game Dinner hosted by Hillside Assembly in Gillett/Oconto Falls WI. 9/24-25/2016 I will be representing TenPoint Crossbows at the Field & Stream store located in Miamisburg OH. 9/17-18/2016 I will be speaking at a Game Dinner hosted by Fortville Nazarene Church in Fortville IN (Near Indy) and then also bringing a message the following Sunday morning. 9/4/2016 I will be speaking at the Covenant Ranch in Buchanan TN. 4/16/2016 I will be speaking at a Game Dinner hosted by Faith Assembly of God in Texarkana, AR. More info coming soon. 4/9/2016 I will be speaking at a God's Great Outdoors "Trail to Adventure Conference" in Hartville, Ohio. Contact Gerry at: (937) 698-3656 for more info. 3/5/2016 I will be the Key Note Speaker at Cedar Shoals Baptist�s 2016 Annual Sportsman Banquet in Cedar Shoals South Carolina. 2/27/2016 I will be displaying the Jerman Buck and speaking at a Wild Game Dinner and auction at Gateway church in Ashtabula, OH. Contact Jeff for tickets or more info (440)478-9427. I will be speaking at a Sportsman's Dinner hosted by Cornerstone Baptist Church in Logan, Ohio. Contact Richard at: (740) 603-1622 for more info. 4/18/2015 I will be speaking at a Outdoors Banquet hosted by Shiloh Community Church in Orleans, Mi. 3/28/2015 I will be the Key Note Speaker at the Sportsmen Family Night at West Chester Nazarene Church on Tylersville Rd. in West Chester, OH. 1/29/2015 I will be showing the deer and speaking at a Wild Game Dinner held by First Baptist Germantown in Germantown, OH. 10/19/2014 I will be the Sunday morning speaker at the Summersville Baptist Church in Summersville, WV. I believe that one or more of my daughters will be in attendance to help with the worship service. 8/23/2014 I will be speaking at a God's Great Outdoors "Trail to Adventure Conference" in Fayetteville, West Virginia. Contact Gerry at: (937) 698-3656 for more info. 8/9/2014 My home church, Abundant Life Tabernacle in Germantown, OH will be hosting a Sportsman's Extravaganza and Bow Shoot. I will be the evening's host and my deer will be there. There will be LOTS of great giveaways! Please contact me for more information. 3/1/2014 I will be the key note speaker this year at the Annual Hunting Expo sponsored by God's Great Outdoors in West Milton Ohio. Syndicated radio personality, Gerry Calliouet will be MC'ing the event. These have been great events and I am once again looking forward to attending, this time as the main evening speaker. I will again have signature cards available and look forward to seeing you there! 2/22/2014 I will be speaking at a Sportsman's Banquet presented by Celina Baptist Temple in Celina, OH. 2/7/2014 I will be speaking at a Wild Game Dinner at Howell's Mill Christian Assembly in Ona WV (near Huntington). 1/13/2014 I will be speaking at the 5th Annual Wild Game Dinner presented by The First Christian Church in Sullivan IN. Click here for more details. 1/12/2014 I will be speaking at a church near West York on Sunday morning. More info coming soon. 1/11/2014 I will be speaking at a Wild Game Dinner held by CrossTies Christian Ministries near West York Illinois at the Hickory Holler Campground. Their website here. 11/17/2013 I will be speaking at Vineyard Community Church during their annual Hunter's Sunday. VCC is located at: 15187 Palmer Road, Etna/Reynoldsburg, OH. More details soon. I will be attending a Trail to Adventure conference and Formula boat factory tour. I will be speaking at a wild game dinner in Michigan. More info soon. I will be speaking at Mt. Zion United Methodist in Carlisle, PA. More details soon. 3/5/2013 I will be attending an event with God's Great Outdoors in West Milton Ohio. These have been great events and I am once again looking forward to attending. I will again have signature cards available and look forward to seeing you there! 3/2/2013 I will be speaking at a wild game dinner in N.E., PA. More details soon. 9/29/2012 I will be speaking at a God's Great Outdoors "Trail to Adventure Conference" at the Ebenezer Mennonite Church in Bluffton, OH. I will be showing the deer and speaking at a Wild Game Dinner held by First Baptist Germantown in Germantown, OH. 8/25/2012 I will be speaking at a God's Great Outdoors "Trail to Adventure Conference" at the Cathedral of Prayer Southern Baptist Church in Charleston, West Virginia. 8/18/2012 The deer and I will be at the YOUTH OUTDOOR DAY event held by Southeastern Hunting And Fishing Club near New Lexington, OH. This 100% FREE event allows young people to explore the outdoors in a fun and supportive environment. 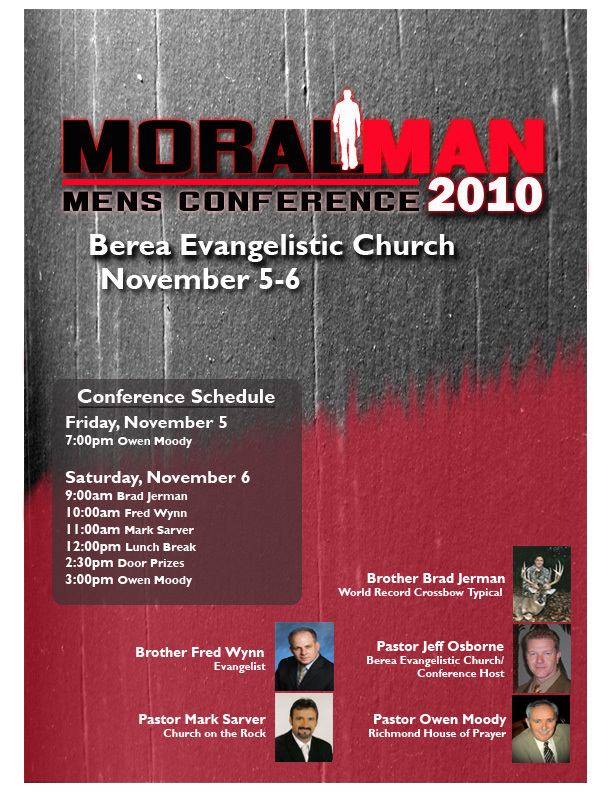 6/1-2/2012 I am one of the speakers at the 2012 Moral Man Men's Conference in Shelbyville, IN. I will be speaking on Saturday Morning and the deer will be on display. 4/21/2012 I will be speaking at a God's Great Outdoors "Trail to Adventure Conference" east of Columbus, Ohio. 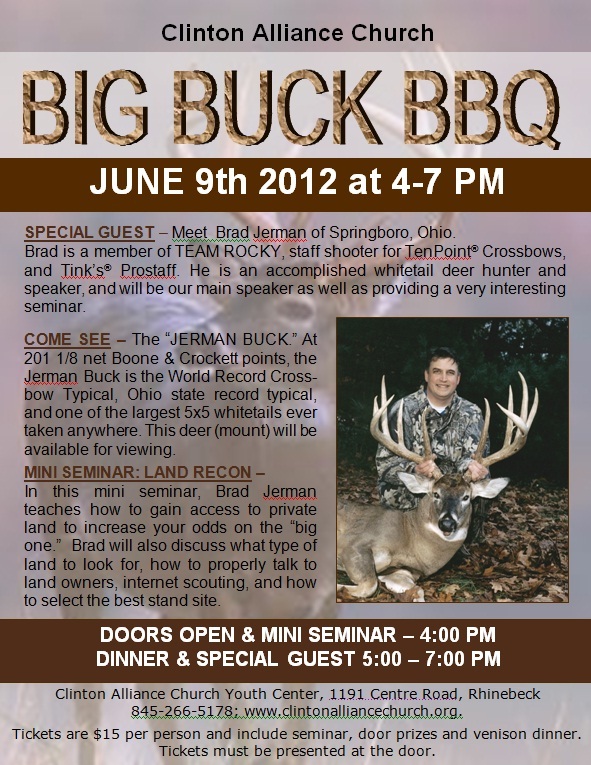 3/31/2012 I will speaking at a Youth for Christ Sportsman Gathering in Paulding County, OH. at the county fairgrounds. The event starts at 6:00 PM. 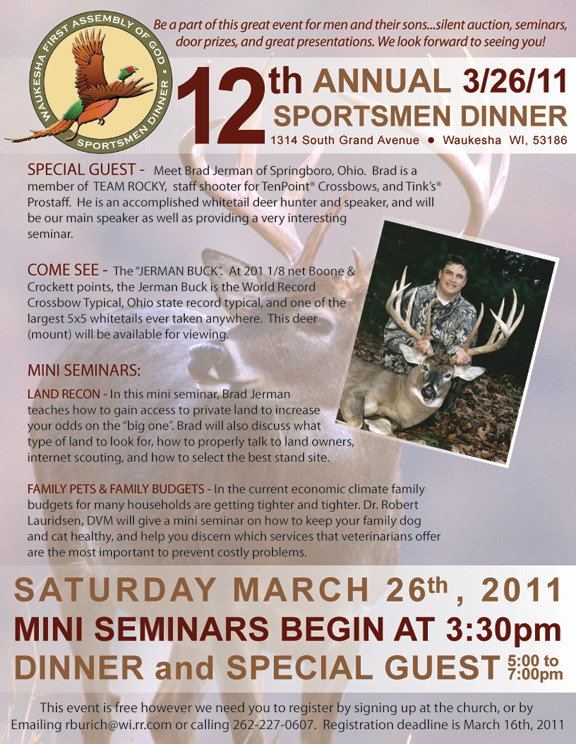 3/25/2012 I will be showing the deer and speaking at a Wild Game Dinner in Heath, OH. 3/6/2012 I will be attending an event with God's Great Outdoors in West Milton Ohio. Key Note Speaker will be Bob Hodgdon with Gerry Calliouet MC'ing the event. These have been great events and I am once again looking forward to attending. I will again have signature cards available and look forward to seeing you there! 2/25/2012 I will be representing TenPoint Crossbows at the Ohio Hunters Educators conference in Greenville, OH. Providing a crossbow seminar and shooting exhibition. I will be showing the deer and speaking at the Hyde Wesleyan Church "Beast Feast" in Clearfield, PA. Should be a great time of fun, food and fellowship. Tickets are $12 and can be obtained through the church office: 814-765-5958. 8/13/2011 Conducting a "Calling and Scent Strategy" seminar at Bass Pro, Cincinnati for their Fall Classic. I will be speaking at 6:00PM. Come on out, should be a great time! I will be speaking at the 11th annual �Wild Game Dinner� held at Chippewa Evangelical Free Church in Beaver Falls, PA.
4/2/2011 I'll be at the Buckeye Big Buck Banquet at the Robert's Center in Wilmington, OH. Looking forward to seeing all the Ohio Monsters from 2010. Mike Beatty and Brian Stephens will also be there with their deer. 3/19/2011 OAA Indoor 300 Championships, Batavia, OH. I will be giving a seminar and speaking at the 1st Annual Wild Game Feed at Marshfield Assembly of God, Marshfield, MO (20 minutes from Springfield). 3/1/2011 I will be attending an event with God's Great Outdoors in West Milton Ohio. Key Note Speaker will be David Hale with Gerry Calliouet MC'ing the event. These have been great events and I am once again looking forward to attending. I will again have signature cards available and look forward to seeing you there! 2/26/2011 I will be speaking at an event presented by Celina Baptist Temple in Celina, OH. There are two sessions (lunch and dinner). 2/12/2011 I will be attending the Outdoors Sportsman's Expo at White Allen Chevrolet in Dayton, OH. 1/29/2011 I will be attending a Whitetails Unlimited banquet in Waynesville, OH. Get more info here. I will be showing the deer and speaking at a Sportsman's Banquet at the First Baptist Church in Eastland, TX. More details coming soon. 9/25/2010 I will be showing the deer and speaking at a Wild Game Dinner at First Baptist Church in Clarkston, MI. More details coming soon. 5/22/2010 I will be attending and speaking at a 3D shoot at Calvary Baptist Church in Wilmington, OH. 3/27/2010 I will be showing the deer and speaking at the 9th Annual Wild Game Event at Ebenezer Mennonite Church in Bluffton, Ohio. The doors will open at 5 pm. Tickets are $10 ea. or a table for 8 for $70. Contact Kay Spallinger at 419-230-9346 or the church office at 419-358-8588 for tickets or any questions. 3/6/2010 I will be attending and speaking at a Game Dinner in Reynoldsville, PA. hosted by Soldier Community Church. 3/2/2010 I will be attending and speaking at an event with God's Great Outdoors in West Milton Ohio. Key Note Speaker will be Hank Parker with Gerry Calliouet MC'ing the event. These have been great events and I am once again looking forward to attending. I will again have signature cards available and look forward to seeing you there! 2/20/2010 I will be attending and speaking at an event with the First Baptist Church of Cherokee, Kansas. Chili Cook-off and Bow-shoot are some of the activities. Contact Ben Scott @ 620-778-1800 with questions or the church office number @ 620-457-8397. Please bring a canned good as admission. 1/30/2010 I will be attending a Whitetails Unlimited banquet in Waynesville, OH. Get more info here. 1/23/2010 I will be attending a wild game dinner at Corry Alliance Church in Corry, PA. Contact Them at: (814) 664-8659 for more information. 1/9/2010 Grant Men's Ministry is hosting a men's breakfast in Grant, MI. and have asked me to come share the deer and my testimony. 8/22-23/2009 The Jerman Buck will be on display at Bass Pro Shops in Cincinnati during the Fall Classic. I'll be there signing pictures on Saturday and Sunday 11:00AM - 6:00PM, I'll be speaking in the seminar area (Times TBD). Come on out and get some great deals! 6/18-23/2009 I will be speaking at one of the 2009 "Fishers of Men" events at the Rushing Wind Retreat Center on Populas Lake Ontario. This fly in event should be packed full of great food, awesome fellowship and amazing fishing. Contact Arnie & Dee Wolf if you are interested in attending. 4/17/2009 I will be attending a Wild Game Dinner at First Baptist in Germantown, OH. I will have signature cards on hand and look forward to talking to this local crowd. 3/14/2009 I will be attending the Sportsman's Spring Expo at Mt. Sterling Baptist Church. I will be signing photos and showing the deer as well as speaking along with Troy Ruiz from Primos. 3/3/2009 I will be attending and speaking at an event with God's Great Outdoors in West Milton Ohio. Key Note Speaker will be David Blanton of Reattree Outdoors with Gerry Calliouet MC'ing the event. 11/5/2008 I will be speaking during the Lord of the Harvest Archery Club's Trophies of Grace Whitetail Deer Hunt at Tar Hollow State Park. I am looking forward to spending some time with these folks in one of the best trophy producing spots in Ohio. 10/11/2008 I will be displaying the Jerman Buck and speaking at Victory Tabernacle's outdoor event near Martinsburg in the eastern panhandle of West Virginia. I am really looking forward to this event. 9/20/2008 I will be attending a Deer Hunter's Workshop near Cincinnati with Ten Point Crossbows. I will have my deer there and will also have photos for signing. Please stop by and visit us at the Ten Point Booth. 9/13/2008 I will be speaking at AHOP's Deer Season Kickoff in Xenia. Other attractions include Richard English and his live deer display and Ben Rising of Drury Outdoors. Many vendors will be represented including Mathews and there will be a silent auction and bow shoot as well as many door prizes. My deer will be there and will also be signing photos. 8/16-17/2008 The Jerman Buck will be on display at Bass Pro Shops in Cincinnati during the Fall Classic. I'll be there signing pictures on Saturday and Sunday 11:00AM - 6:00PM, I'll be speaking in the seminar area (Times TBD). Come on out and get some great deals! 3/4/2008 I will be at an event with God's Great Outdoors in West Milton Ohio. Key Note Speaker will be David Morris with Gerry Calliouet MC'ing the event. 3/1/2008 3/1/2008- I will be speaking at a dinner hosted by the Fellowship of Christian Hunters. It will be held at the Lighthouse Ministries facility in Columbus. Contact Jim Leezer for more info. 2/23/2008 I will be speaking at a Wild Game Dinner held at the Spring Meadow Family Worship Center in Fishertown, PA. Contact Spring Meadow at: (814)839-4427 for more information. 1/23-27/2008 I will be attending the Cincinnati Hunting and Fishing show with Ten Point Crossbows. The deer will be there and I am planning on being there most evenings. I would love for you to stop by and see the deer as well as the new crossbows that TenPoint has this year. I will have photos to sign as well. 10/6/2007 I will be attending a Deer Hunter's Workshop with Ten Point Crossbows. I will have my deer there and have been asked to also have photos for signing. Please stop by and visit us at the Ten Point Booth. 9/22/2007 I will be speaking at an Outdoor Ministry seminar facilitated by Gerry Caillouet of God's Great Outdoors. It will be held at the Cornerstone Baptist Church in Springfield, Ohio. 9/15-16/2007 The Jerman Buck will be on display at Bass Pro Shops in Cincinnati during the Fall Classic. I'll be there signing pictures on Saturday and Sunday 11:00AM - 7:00PM, I'll be speaking in the seminar area at 1:00PM on Saturday & 3:00PM on Sunday. Come on out and get some great deals! 6/21-23/2007 I will be attending Boone & Crockett's 26th Award ceremony at Cabelas in Ft. Worth, Tx. The original antlers are on display there currently and will be until the close of the event. It should be a great time. 4/20/2007 My home church, Abundant Life Tabernacle in Germantown, OH will be hosting a Sportsman's Banquet fund raiser. I will be the evening's host and my deer will be there. There will be LOTS of great giveaways as well as wonderful auction items. The event proceeds will be used to enhance the Breaking Free program. Breaking free is a faith based outreach/support group dedicated to helping men find the keys to defeating personal addictions. Please contact me for more information. 3/24/2007 I will once again be attending the National Wild Turkey Federation (NWTF) fundraising banquet at Arbor Hall in Dayton. I had a great time last year and I'm sure this year will be better than ever. Contact me if you are interested in attending. A ticket will be required. 3/2-4/2007 Erie Promotions 25th annual Sport and Travel expo held at the Family First Sport Park, in Erie, Pennsylvania. This is the farthest northeast I have come with the deer. Come on out! I would love to meet you and talk deer for a while. Visit www.sportandtravelexpo.com/eriemain.htm for more info. 2/24/2007 I will be attending a Wild Game Dinner at Harvest Community Church in Kittanning, Pennsylvania. I will be signing photos and showing the deer as well as speaking to the men. I have also arranged to be at the Sunday morning services. 2/3/2007 I am very excited about the opportunity to travel to Brookshire Texas where I will be appearing with Gerry Caillouet and Daryl Christensen at a Sportsman's Banquet facilitated by First Baptist Church. The night prior to getting contacted for this event, I was at church praying fervently for God to enlarge this ministry. Be careful what you pray for! God is looking to bless his followers in ways they can not even imagine. My taxidermist Randy Walling, is working feverishly to complete a show mount compact enough to be checked as baggage for the flight. This one will feature removable antlers on an upright form. Please contact me for more information or call the church at (281)934-2446. 9/16/2006 The Jerman Buck will be on display at Bass Pro Shops in Cincinnati during the 2006 Fall Classic. I'll be there signing pictures on Saturday 10:00am - 6:00PM. This is always a great sale and there are plenty of extra things to do and see. 8/12/2006 I will be speaking at the 6th annual Wild Game Extravaganza in Pataskala, OH. It is hosted by Buckeye Harvest Sportsmen who are an outreach group of men from Jersey Church. There were several thousand in attendance last year so I expect this to be a great event. 4/8/2006 Faith Alliance Church is hosting a wild game dinner in New Bremen. For more information and/or tickets call Matt Tangeman at 419-629-0194. 4/1/2006 I will be attending a Sportman's Banquet at Westfall High School in Pickaway County. 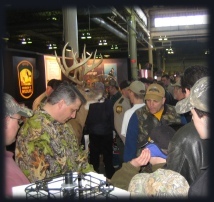 3/25/2006 Ohio Deer & Turkey Expo in Columbus. I will be displaying the deer and signing photos from one of the Ohio Division of Wildlife booths. I'll be working with TenPoint Crossbow Technologies on Sunday. 3/17/2006 National Wild Turkey Federation (NWTF) fundraising banquet at Arbor Hall in Dayton. What a great group of folks! 3/04/2006 I will be attending a Wild Game dinner at Urbancrest Baptist Church. 2/25/2006 I'll be at the Buckeye Big Buck Banquet at the Fin Feather and Fur. Looking forward to seeing all the other Ohio Monsters from 2004. I should arrive around 1:00PM. 2/10-12/2006 Displayed the deer at Jim Strader's Outdoor Show and worked in the TenPoint booth. It was great to meet several of the folks I have developed friendships with online. I also fell in love with TenPoints new ProFusion crossbow. It is an awesome bow for the money! 1/28/2006 8th Annual Sportsman's Night Out at Hillsboro Baptist Church. I had a great time giving clinics; relating the story and a few hunting tips. I was then able to speak to the entire attendance focusing on my testimony and the goodness of the Lord. 1/14/2006 I will be attending a Sportsman's Banquet in Xenia. More details shortly. 8/27/2005 I will be attending a Whitetails Unlimited banquet in Xenia. I had a great time meeting every one and won a few auction items. The Mech skinning knife which was one of the items has served me quite well. 8/20/2005 I attended the 5th annual Wild Game Extravaganza in Pataskala, OH. It was hosted by Buckeye Harvest Sportsmen who are an outreach group of men from Jersey Church. I had a great time meeting everyone and signing pictures. The highlight was at closing there were at least a dozen men and several women who dedicated their life to the Lord. I'm certain there were more. Way to go folks! I encourage all of you to continue to profess your faith and grow in the Lord. 8/13/2005 The Jerman Buck will be on display at Bass Pro Shops in Cincinnati during the Fall Classic. I'll be there signing pictures on Saturday 11:00am - 4:00PM, I'll be speaking at 1:00 in the seminar area. Come on out and get some great deals! 7/29-31/2005 We were honored to attend the 2005 Buckmasters Expo where the Jerman Buck was co-awarded the Golden Laurel Citation. I am very honored that my deer was selected. The award recognizes the most significant deer entered into the Buckmasters Trophy Records during a given year. I shared the award with Jeff Severson from Wisconsin and his great Kansas buck. He and his wife were a pleasure to spend time with and everyone from Buckmasters was great! 3/18-20/2005 The Jerman Buck will be on display at the Ohio Deer & Turkey Expo. Look for me in the Ohio Division of Wildlife booth on Saturday. 3/5/2005 We will be displaying at the Safari Club International, Central Ohio Chapter 2005 Annual Fundraiser Dinner. We are planning on having the buck measured for Safari Club International's record book and then it will be displayed during the event. I will be on hand to answer questions and we are working on publishing pictures to sign. 1/22-23/2005 The Jerman Buck will be on display at the Cincinnati Hunting & Fishing Show. (more info). Come on out and visit with me. 1/15/2005 Panel score and press release at District 5 Wildlife Office here in Ohio (more info). The scoring that takes place that day will determine if the Jerman Buck is the new state record typical deer for the state of Ohio. I have been told that the buck will be panel scored by two separate groups of two with an authoritative witness for both. These two scores will then be compared to the first official score that will be performed on the 10th. Note: This panel scoring is NOT related to the Boone & Crockett awards panel score that will occur some time in 2007. 1/10/2005 Official Boone & Crocket Measurement for record submission (more info). This score will be performed by Gary Trent, the president of the Buckeye Big Buck Club. Please contact me for interviews, photos or appearances.